When it comes to releases from the Memphis Recording Service, I seem to be buying them backwards. After getting Tupelo's Own Elvis Presley and then My Baby Left Me I was so impressed I went for The Rise of Elvis Presley - Volume II 1955. After receiving it yesterday I can only say it's another winner. This set includes a book, a DVD with audio and the first known footage of Elvis, and a vinyl repress of the original "Mystery Train" Sun single. In other words, a lot of goodies for an Elvis fan. I think the thing that impresses me the most is the book. With over 350 pages and a good balance between photos, text and documents it gives you a whole new understanding of Elvis and his career in 1955. The photos show Elvis on and off stage, with fans and musicians, and what I really enjoy - the way he dresses. Man, he really had his own style with those shirts and jackets! And one period he even had a perm (and so did Bill Black, judging by some photos). But most of all, the book tells the story of how hard Elvis worked that year. His touring schedule was "hectic...and contradicts the notion that stardom came easily to Elvis," like it says in the introduction. Including his performances on the Louisiana Hayride, according to the list in the back of the book, he made over 300 shows! Speaking of the Lousiana Hayride, I have to mention Joyce Railback's diary. In it she kept track of all the songs Elvis sang on the Hayride when she listened to the radio, and excerpts from it are found throughout the book. When it comes to the DVD, it is a little awkward that you have to play it on a DVD, but it's great listening to the "Fool, Fool, Fool" and "Shake, Rattle And Roll" acetates in much improved sound quality. Also, the few seconds of film showing Elvis at the Jimmy Rodgers Memorial Celebration, ads another piece to the Elvis puzzle. Finally, the "Mystery Train" single, processed and pressed from the Sun master "mother stamper" makes for a bumpy ride with a lot of background noise. Nevertheless, it's a nice inclusion. If I haven't convinced you to buy The Rise of Elvis Presley - Volume II 1955 already, then maybe this review can help you change your mind. 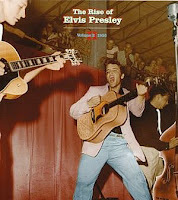 As for me, I'm gonna order its companion, The Beginning of Elvis Presley - Volume 1 1953-1954, today! Great releases. Love the rare pics. A pity I don't own a record player. Bought the first 3 at the Tupelo Hardware store in 2007. Pricey, but hey, no import cost. Tupelo's Own is tops: Footage with sound of Elvis performing live in the 50s ... out of this world.